Each year, approximately 265,000 Americans have a stroke that causes visual impairment. 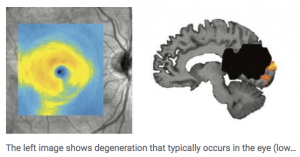 New research, which appears in the journal Proceedings of the Royal Society B, sheds light on how the damage in the brain caused by a stroke can lead to permanent vision impairment. The findings could provide researchers with a blueprint to better identify which areas of vision are recoverable, facilitating the development of more effective interventions to encourage vision recovery.